‘ A hidden key unlocks an ancient castle’s door. As it creaks open on rusted hinges, the whisper of a dank, stale wind delivers this chilling warning; Danger awaits you. Yet within these dark and ominous walls lies your quest. Welcome to Castle Shadowgate. Your destiny as the last of a great line of hero-kings, is to terminate the diabolical Warlock Lord before his dreaded black magic unleashes the hideous Behemoth and destroys the world. With a strong heart and shining armor, you carefully choose your path of travel throughout the castle’s sinister grounds. Along the way, you’ll discover strange and wondrous objects. Some things may be useful on your journey. Others may be deadly to the touch. Three-dimensional images, unsurpassed graphics and special sound effects unfold as you venture through those grave ruins. But beware! Using screens and graphics like those in the best interactive PC games, Shadowgate is the most challenging, participatory adventure you’ve ever experienced on the Nintendo Entertainment system! Well the cover of the game does do a little attention grabbing but has nothing to do with the game at all. I don’t even think there was a gargoyle in the game for that matter. So the cover gets a big fat 0. The back of the box does explain the game pretty well. It is a point and click game like those that were on the PC all those years ago. The only thing I know that wasn’t the exciting is the part where it exclaims the graphics as unsurpassed. I had this game as a child and though I did enjoy the game, the graphics are far from amazing. If you’ve played a point and click game the screen you are playing on has very limited movement if any at all. This plays exactly like all the old point and click games for the N.E.S. system. But, the company that released this game was pretty much the only company that released games like this for home console. The problem with the game is some of the controls are kinda wonky. You’ll be trying to select a certain thing on the screen like. USE – whatever item – and you’ll use the wrong thing and waste something that is important to the quest and not be able to defeat the game. There are several items that can end your quest in it’s tracks and you would never know until you looked up a cheat FAQ off a site and realize that you are stuck forever and have to start over. There isn’t too much to really say here. It plays exactly like a point and click 8 bit console release in perfection. The only problems with is what i mentioned in game play. Though this game received a high D on a rating score, it is still a fun play if you are more of the sit back and relax style gamer. There isn’t any jumping or attacking. It’s just figuring out how to get to the next room with what goods you have in your stock pile of stuff. 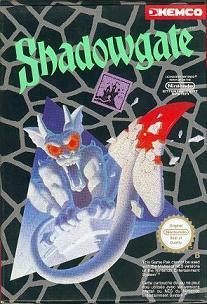 I really enjoy this game but on the points out of 30, unfortunately the box art ran shadowgate’s score way down. ‘A teenager’s dream vacation on a tranquil south sea island… A shotting star!? … It’s an omen of disaster! Mike’s archaeologist uncle has been kidnapped. Mike alone can rescue him. Thus begins the test of island courage. Happy villagers eagerly assist, but endless enemies threaten every step. 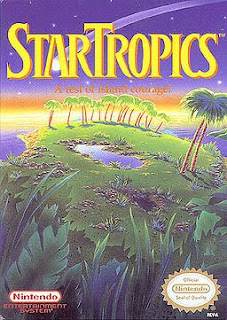 Mike’s search leads him through the lush wilderness of the StarTropics. As he travels on foot, or by submarine through this sunny land of dark secrets and deadly peril, Mike is a tireless fighter. Using common sense, an island yo-yo, magic potions, and mysterious new weapons and skills, Mike must defend himself. Restore his strength with coconut milk, help him defeat strange creatures, sea monster and hidden attackers. Join Mike in his adventure. Journey the StarTropics. The cover of this game leaves a lot to the imagination. It’s an excellent vacation resort shot, but it does make you think about what you are in store for. But, It doesn’t really give you any idea of what you are going to be playing at all. The explanation of the game opens up everything you are hoping for in a game. An interesting sounding adventure plot line with one of my favorite weapons, a yo-yo. This game plays to perfection. It’s a little strange when you first start. It has the Dragon Warrior/Final Fantasy style top down view when you are searching the island and towns. Yet, when you arrive into an actual dungeon it takes a quick switch to a pseudo zelda style play. Your character Mike changes from the chibi version RPG character to a full blown character. The play field is sorta new and different for a nintendo title. There is a lot of random block jumping that occasionally open up new areas. Finding some of those really was the only pain of the game. But, i found no actual flaw in the game play. StarTropics kind of made it’s own style action platformer. I can’t really think of any game on the nintendo that plays anything like it other than the few quirks of the overmap RPG style searching. The in game battle style is sorta like Zelda but not really at all. It’s funny how jumping can add such a change to top down adventure game. I really enjoyed playing through this game. It was a large change to the same old platformer that most of all the nintendo games are. Start at left go to the right until the boss fight. This game doesn’t have anything in that range. The designers took the best of the best out of the top ranked games and made their own baby. ‘The Journey of Kuros continues…..
You are Kuros, the knight warrior Hero of the books of excalibur. Your journey begins deep within the woods of Elrond, where even the wind obeys the Supreme Wizard, Malkil. But Malkil has strayed from the path, and is now part of the dark side. In caverns of fire, through demons that fly and crawl, against the soldiers of the undead you must continue. No sorcery can prevail. For you are the only knight with the strength to wield the Brightsword. 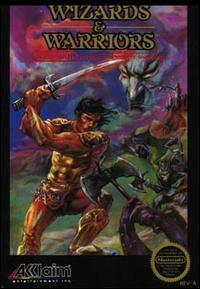 Now before I get started, I am a sucker for barbarian anything so this cover catches my attention instantly, but once you start the game you are not a barbarian at all, you are a knight. Once again, fooled by Nintendo box art. But! The back of the box does tell me that I’m a knight from excalibur, so I’m not as disgruntled as I would have been if it didn’t explain this to me on the box. The game does in fact live up to the explanation perfectly. It doesn’t really tell you anything about the game play other than a few clues on some of the items you will recieve. But, the images don’t try to trick you like a lot of the other games i’ve played have. Kuros has some amazing skills indeed in this platformer style game. He fights flawlessly with his sword style, he can jump like Jordan, and he can run faster than Mario. But, unlike most platform style games this one moves all over an area map instead of just going right. Which is a great change of pace. The potion power ups in this game are kind of odd. A pink potion grants you huge jumps, the blue makes you run even faster, and the red protects you from small damage. The other items you gain from from giant treasure chests actually stay in your inventory and you can use them for the rest of the game. Other than a few items that switch out. Level progression only continues if you find all three keys and get enough money to make the knight move out of the way so you may fight the lurking boss. This is an amazing action platformer. There are very few games of this type that let you free roam an entire map on the nintendo. Most of them once you’ve moved forward you can no longer move back, because of the screen stop. In Wizards and Warriors you can freely move back and forth at will and enter doors to find other areas with goods in them. All around excellent game. ‘You’re the quarterback in this amazingly real football game! 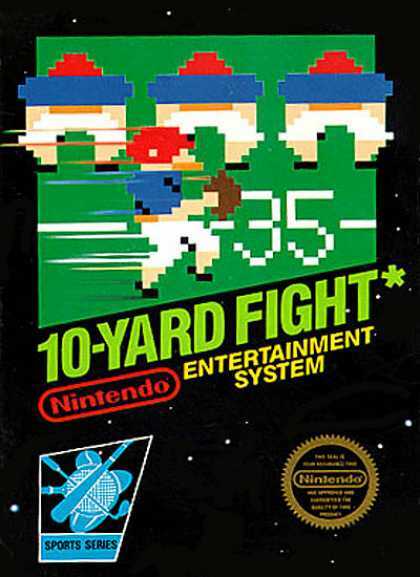 The cover of 10 yard fight is an actual screen shot of the game. So it gets a point for showing you exactly what you will be playing. The back explanation is a huge lie. This game is no where near a real football game. I mean at the kick off your receiving team is standing in a rectangle in which your receiver (in the middle of the rectangle) catches the ball and you head upwards towards that 6 points. The game play is just awful. Sometimes when you hike the ball to early you are instantly downed. So if you don’t wait for your half back or other player to run passed your quarterback before hiking the ball you are screwed. Now, that doesn’t sound too bad other than it takes about twenty seconds for him to get passed you. And sometimes you just randomly kick the ball for a field goal or punt for no apparent reason. The character models are all the same guy just colored differently which isn’t anything new on nintendo and it doesn’t lose points for it, but the hilarious thing is all of their tackle sprite action looks like a screwed up version of frogger jumping across to his goal. This is easily the worst football game I have ever played in my life. And, the fact that it says that I will feel like i’m on the fifty yard line is just bull crap. This game feels like i’m playing a strange version of football that doesn’t know what it is. The only reason to play this game would be if you got it for less than a dollar for a good laugh. 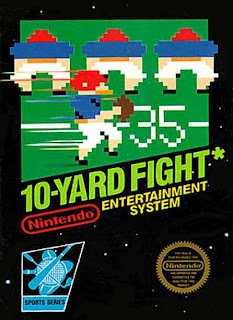 There are so many other football games on the nintendo that are better. Well, all of them are better. Just stick with the Tecmo Bowl or Super Tecmo bowl. -Note: This game was developed by the designer of Resident Evil! Pretty sweet! If you are a Capcom fan, you already know that almost every Capcom game on the NES is pretty amazing. It doesn’t even matter what the title is. Little Mermaid to Mega Man; They are all pretty good. Now this game on the other hand is no usual Capcom game for the time period. Or really any game at the time for that matter. This game Screams HORROR MOVIE!! And, well, It is actually based directly off a horror movie. Which as far as the NES went. Most of those are pretty terrible… generally. But, This one at first glance says hey Horror nerd… you need this. The explanation of the game is pretty straight forward. What it says is pretty much what you get. So over all.. this box did a pretty good job at telling you what’s going on. Now do note, that this game was not an american release, and recently was translated and printed for america through a reproduction site. It’s slightly hard to come by, but you can find them, or even get them printed yourself through a few different websites. Now I can tell you that I wasn’t really prepared to be playing an NES style RPG. These are not too common on the system and generally do not play anything like this game… At all. It does have a Dragon Warrior/Final Fantasy attack style, with random battles. But, the game itself is more directed towards solving tons of puzzle like elements, using items you find around the house. Now one of the things that is completely strange for a game of this genre, is having complete control of 5 different characters. Each character has their main item you can use in the game for certain areas. So each person has their own ‘expert’ item. Which as you play for a while, you do find substitute items for these characters. WHY? you might ask yourself… BECAUSE YOUR CHARACTERS CAN ACTUALLY DIE! What? Die? No revive spells? My camera man is dead? Well wha…? Yes… this was amazingly surprising to say the least. If your character dies… he or she is dead.. forever. Another weird aspect of this title is that you can pair up any 3 characters as you wish. and move each person individually. Pairs of two or three. Because you do actually have to use each character’s abilities. There is a master of unlocking, a master of lighter, a master of camera, a master of healing ailments, and a master of vacuum. Yep. Vacuum. ha. You do not get an unlimited amount of items either. Each character can carry one weapon, and 2 extra items, so you have to be very careful as to what you are doing. The only blunders are a few items only work in certain situations and can be horribly used and wasted. I will just say the block of wood. It is amazingly important earlier on. But, if it’s used too many times.. you can fall into quite the predicament. There are a few other things, but they really aren’t that annoying. I ran into a couple glitches here and there, but it was nothing that froze the game up or screwed me in any way. I can say that this is probably the best RPG I’ve ever played for the NES. And I absolutely love Gargoyle’s Quest II, Dragon Warrior(s), Final Fantasy, Faria, StarTropics, and so on and so forth. But, this was just something I had never expected to play. It was like they looked into the future of what games could be and made one of the best possible Rpg of it’s time. It’s a shame that I never got to play it as a kid, you know, being american. But, I can say if you love RPGs, You need to play this game. If I haven’t said get this and play it yet. That’s my over all review. If you don’t dig RPGs, you probably won’t like it. But, if you don’t like RPGs, but you do enjoy horror related stuff. You should play it. There is really no learning curve. The stuff does what you would expect it to. EXPLORE, FIGURE OUT THE ODD MESSAGES, KILL, and SURVIVE! As I’ve mentioned a few times already. This game was not released in America. 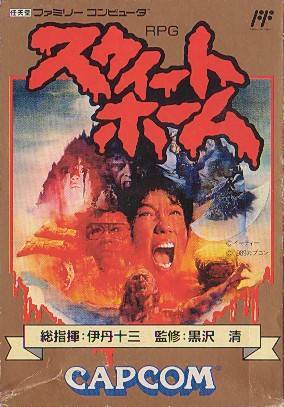 The reason being is the gore, story line, and some of the 8 bit video scenes that do happen. I won’t tell you any of the wow… moments. I can just say that if you give this game a chance, and play through it. There are a lot of Holy Crap.. Okay.. yeah.. that wouldn’t have gone over well in 1989. At this point in time. This game would easily still be an M rated title, but it was released long before that system even existed. Capcom said we made this. An american censor checked it out and went nope… not in our country. Which is unfortunate and has happened, and still happens, with a lot of japanese titles today. But, as we move forward; our fellow nerds find a way to get it to us. So I’d like to give a big thanks to the teams of people or the one guy that translated this to a point that someone could print it and slightly Market it to us. GORE! GORE! GORE! GORE! and GORE! Each category gets a possible 10 points. So the game can achieve 30 over all points. This is based into a Grade Point average. Occasionally, with newer titles.. we may add achievements, trophies, and the like for a separate non average grade. and as all games should have, arbitrary non affecting points for sexual intent, gore, and just awesome-ness. Check back, follow us, tell your friends. If you have games you’d like us to review, let us know, and we’ll see if we can get a copy of the game.